Test your knowledge of some of the more notable scandals. 1. 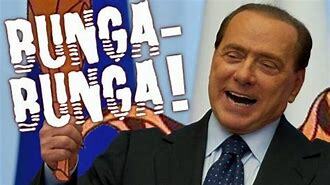 Italian Prime Minister, Sylvio Berlusconi was famous for his Bunga Bunga parties. What are Bunga Bunga parties? 2. What was the name of the man who hit U S skater, Nancy Kerrigan with an iron bar? 3. Which rock’n’roll star married his 13 year old cousin? 4. What was the last name of the lady Lynndie who led an Iraqi prisoner on a lead in Abu Grahib prison? 5. What did Donald Trump say he should use before making his infamous remark about molesting women? 6. The Piltdown Man was a scientific hoax that used the head of a man and the jaw of what primate? 7. Which designer fashion label produced the German SS uniforms? 8. Which of the following controversial things has Prince Harry not done? C. called Pakistani members of Sandhurst Academy "ragheads"
9. Which US President is strongly suspected of fathering six children with his slave girl? 10. In 2017 when La La Land was wrongly announced as Best Picture, what film was eventually named the winner?